One of the easiest elements to change on a page is the headline. It’s also one of the most important parts of the page to optimize if you’re trying to get a lift in your conversion rate. However, when tasked with writing an engaging headline for a marketing piece, many marketers get it wrong. In this Web clinic, Dr. Flint McGlaughlin, Managing Director, MECLABS, speaks to this problem. In addition, Dr. McGlaughlin shows how 6 real-world headlines (submitted by our viewers) could be changed to increase customer response. To begin the Web clinic, Dr. McGlaughlin illustrated how researchers at MarketingExperiments were able to test 10 headlines for an online survey company. What was particularly interesting about the case study was that while Friction was reduced considerably on the landing page, the element that affected the conversion rate the most was the headline. The winning headline combined with the reduced page Friction generated a 10.4% lift in conversion. 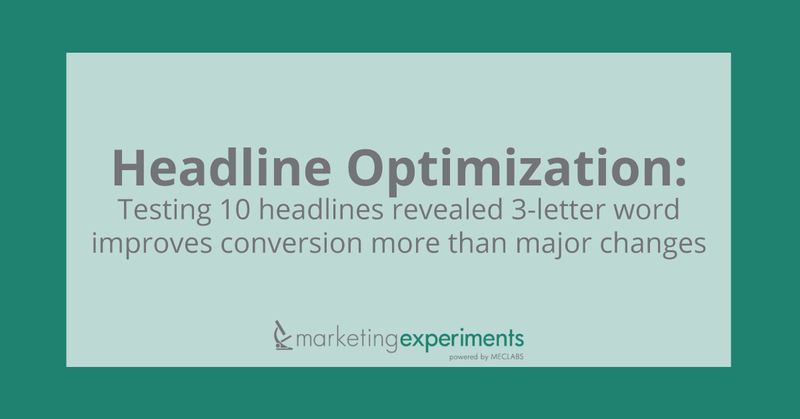 Concluding the case study, Dr. McGlaughlin analyzed the results to uncover how and why the better-performing headlines achieved a higher conversion rate than the lower performing ones. After arranging the headlines in order of performance, Dr. McGlaughlin began to guide the audience into looking for patterns in the results. The second pattern we discovered was that all of the top-performing headlines positioned the value point at the front of the headline while the lower-performing headlines positioned it near the end. Principle #1: All marketing messages must be centered primarily on the interests of the customer. Therefore, when it comes to crafting headlines, emphasize what the visitor gets rather than what they must do. Principle #2: The goal of a headline is similar to the goal of the opening scene of a movie — to arrest the visitors attention and get them into the first paragraph. Therefore, utilize a “point-first” structure (i.e. place the value at the front of the headline). After illustrating these key principles, Dr. McGlaughlin moved quickly into the Live Optimization of real headlines submitted by our viewers. Aided by two of MarketingExperiments Senior Research Manager, Jon Powell and Research Manager, Tony Doty, Dr. McGlaughlin moved through 6 headlines with practical tips and advice on how to improve them. View the clinic replay, or listen to the audio recording (mp3), to learn from our researchers as they discuss how to optimize headlines.